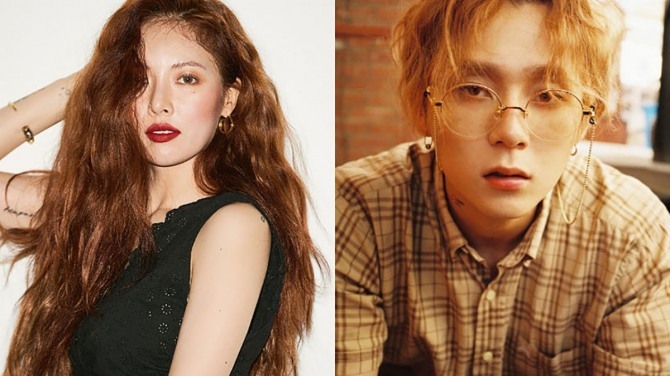 Cube Entertainment is under fire for canceling Triple H’s promotion schedule, just a day after confirming HyunA and E’Dawn were dating. On Saturday, the agency announced that Triple H would not attend its upcoming appearances on music programs “Music Core” and “Inkigayo,” which were slated for Saturday and Sunday, respectively, due to internal affairs. Since the release of its recent album “Retro Futurism” on July 18, the trio has so far attended only one music show, which was “Music Bank” on Friday. The agency confirmed, however, that the band will wrap up its promotions for the album following the cancellations of the remaining schedules. It went on to state that the upcoming fan event, scheduled for Saturday, has also been canceled, apologizing to fans and sharing a link for a refund. Earlier on Friday, the two Triple H members personally confirmed that they had been dating for two years. The agency had initially denied the dating rumors, but HyunA shared a post on her Instagram to tell fans that she started dating her bandmate around May 2016. “I just really wanted to be honest,” the singer wrote. Despite the couple’s bold action and honesty, its agency has struck a negative chord with many fans, angry that it canceled all the group’s remaining schedule. Many of fans also expressed disappointment toward the couple and the agency, questioning whether Triple H would be able to continue its promotion after all those blows.